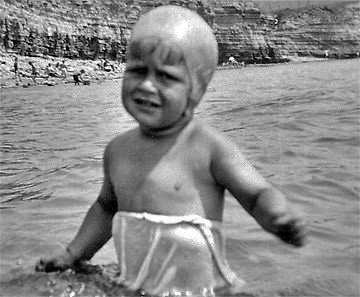 Like most kids brought up on a council estate in an urban conurbation in the fifties our first travel experiences were our once a year holiday to the sea-side resorts of Wales. 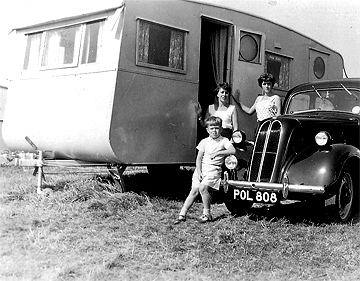 We always tried to have a family holiday during the summer that is, when we eventually had a car. We had a motor cycle and sidecar up until I was about 6 and we would not travel too far in that. But we must have got to the sea side somehow because the photos show me there. 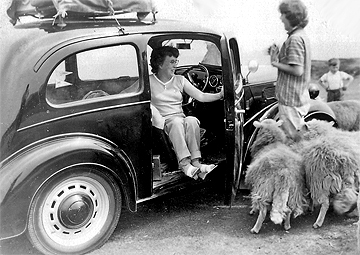 When we eventually had a car we would go on holiday for one week in the summer never two. Our main destination was Rhyl. Rhyl has long been a popular tourist destination for people all over the North West of England as well as the Midlands. 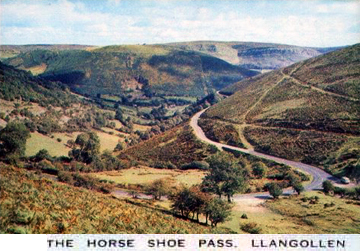 It was close but it would still take all day to get there going over what was familiarly known as The Horseshoe Pass. The A542 road running northwards over the Horseshoe Pass would reach a height of 417 metres or 1,367ft above sea level. It offered some of the most spectacular views in Wales as it climbed from Llangollen around a wide valley to form the shape of its name.This was in the late fifties an arduous trip. A bit like (The Oregon Trail). The Horseshoe Pass (Welsh: Bwlch yr Oernant, “Pass of the Cold Stream”) is a mountain pass in Denbighshire, north east Wales. It separates Llantysilio Mountain to the west from Cyrn-y-Brain to the east. The A542 road from Llandegla to Llangollen runs through the pass, reaching a maximum height of 417 metres (1,368 ft). The road travels in a horseshoe shape around the sides of a valley, giving the pass its English name; this route dates from 1811, when a turnpike road was constructed across the area. The road is frequently closed in winter due to snowfall or landslides. The small car would struggle to get up and over this pass but once we had started to descend on the other side we felt as though we were on holiday.The trip itself was always a nightmare because my mom and dad would argue and argue and argue. My mom always got travel sickness through my dads driving. On one occasion we got to our caravan and they had argued that much and she was so fed up we did not unpack and drove all the way home. 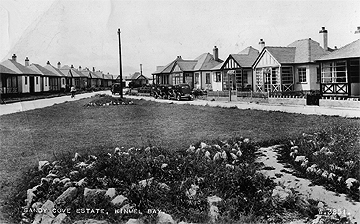 The origin of the name “Rhyl” is not fully known. However, the name appears in old documents variously as Hyll (1506), Hull (1508), [Leidiart] yr Hyll (1597), Rhil (1706), Rhûl (1749), Rhul (1773) Rhyll (1830), and Rhyl(1840), all of which are variations (and some anglicizations) of an uncertain original form. Other suggestions have been made that it might derive from the similar sounding Yr Hill (as in “The Hill”) or Yr Heol “(The Street)”. Another theory is that the name Rhyl originates from the Welsh Tŷ’n yr haul meaning “House in the sun”. The oldest known dwelling is called Tŷ’n rhyl; and the town marketed itself as a resort as ‘Sunny Rhyl’. Rhyl, Prestatyn Kimmel Bay where we stayed in chalets and I remember my mom often telling the tale of how she spent the first day cleaning it to her utter disgust of the state she found it. We also went to Tenby and Saundersfoot. 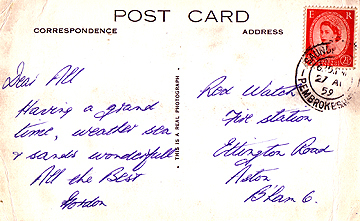 The card above was sent from my dad to his watch on the fire station Erdington. My mom was very fond of the bingo and penny arcades and we spent many a wet day pushing a maximum of 12 pennies into various shiny noisy slot machines. 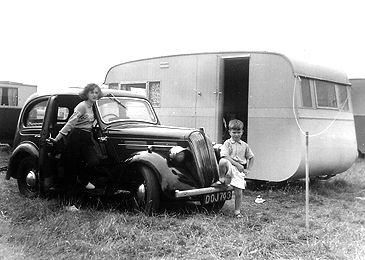 One most memorable holiday was spent in a tiny caravan at a place called Lavernock. 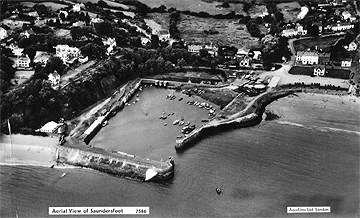 Lavernock Point is a headland on the South Wales coast, overlooking the Bristol Channel with views across to the Somerset Coast. A mixture of Jurassic and Triassic rocks can be seen at Lavernock. Fossils are quite common at Lavernock, with brachiopods and bivalves being the most common. Ammonites can be found, but you are more likely to find worn ammonites and ammonite fragments.I remember sitting high on the cliff tops in the caravan watching the massive ships sail up and down the channel. It was always misty with a thick fog and the sound of the light house fog horn was an eerie companion. 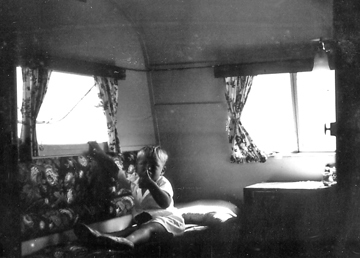 I often rained and we spent a lot of the time huddled in the caravan with the gas lamps hissing and the rain battering on the roof. My dad would entertain us with his imitation of the fog horn. On these annual holidays we would spend one week never two on a holiday caravan park. This would have to have a bar or a room where mom and dad could have a drink and play bingo. We kids would have to make do with a bottle of pop and some crisps outside even when my dad stopped the car to have a drink at the pub we the kids would have to stay put in the car. Which way to turn now? Into the arms of a hopeless lonely sleep? At Corton a Warners camp just north of Lowestoft we had for me a memorable stay I enjoyed it so much I remember I burst into tears when it was time to go home. I had my first crush on a much older lady her name was Nancy I was maybe 10 years old. We were there with the Fox family good friends of my mom and dad Diane won miss Corton and I entered the fancy dress as Tarzan I hated doing that! In 1966 I was around 14 and my sister was married we went to Littlehampton. My dad was on convalescence from the Fire Service and we went to a flat of the Benevolent Fund on the south coast, Marine Court. Here we watched the World Cup Final and England beat West Germany. And I burst into tears when West Germany equalised in the 90 minute. Was that you I saw there at the bingo stall? If you click on the picture it will link you to You Tube footage of this memorable win for England. If you do note the Union flags flying not the England George Cross of today’s games. For some reason or an other I have collected things from my travels like most folk do but I have saved tickets and maps and guide books. 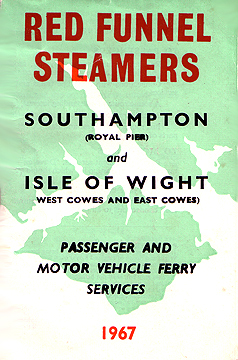 I think that the postcard above and the brochure of the Red Funnel Steamers are the earliest I have. A few years after I would continue saving all sorts of bits and bobs, post cards, tickets and I started to do sketches in books and write poetry. On the IOW the place we stayed had a pool and I was more than pleased with this luxury despite the fact that the water was cold. 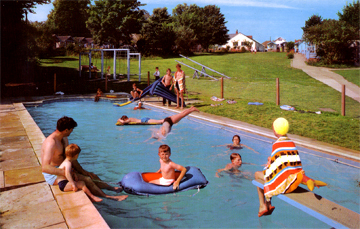 I remember spending lots of time in the pool or mostly the sea at this time in my life during holiday week. I would spend hours sitting astride a lilo using at as some kind of pirate ship. It was here too that I was allowed to use my dads camera and also he had a standard 8 movie camera that he let me use. I took some film of The ferry boat and The Queen Mary as it passed by but it was only a dot on the horizon. This I found out later was The Queen Mary’s final voyage across the Atlantic Wednesday 27th September 1967. 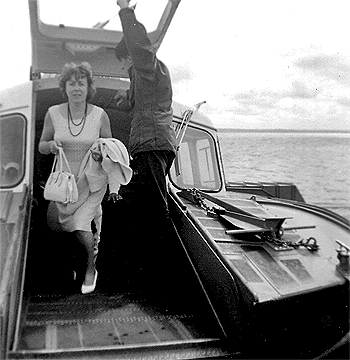 In 1967 The Isle Of Wight. The Island was where my dad’s mother was born so he still had some family links there. One being his half brother, Les, his wife Stella and their family. Here we stayed at Wooton Holiday Chalets. On this holiday I had my first feelings of not enough to do for me. 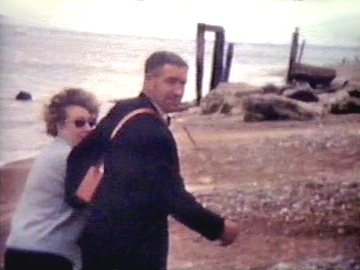 We went to Alum Bay and I did some filming there of my mom and dad on the beach. The chalet location on the IOW holiday also had a bar and I was allowed in The barman had music playing and it was on this holiday I first heard The Dubliners. You can see and hear Luke Kelly and the boys if you link from the image above and from the Luke Kelly link in the text below. A Drop of the Hard Stuff was the name of this album and I thought it was great. I cannot remember the date but it must have been 1968-69 ,I went to see the Dubliners play at the Birmingham Town Hall and in New Street I almost bumped into Luke Kelly with his grizzled face and wire hard flaming red hair and beard with a face to match. He looked every inch like the wild Rebel I had imagined he would look. My mom said that if I ever took to drinking and travelling that when I got to Ireland they would think of me as one of them as I knew all the words to all the songs. They were great and I had a Irish Republic love affair and did drawing of Free Ireland Now! And bought there albums. Much later on maybe in 1992 I went again to see the Dubliners at The Hippodrome in Birmingham and “Barney” McKenna or Banjo Barney McKenna was sat in the foyer having a beer and sat down by him asked him to sign my ticket and this made my Dubliners involvement complete. In fact when we met up with Marie and Daniel and our other friends on the Antrim coast in 2007 we had a great time and I did know all the songs and all the words and the guys playing in the bar though I must be Irish. Alum Bay is the location of a classic sequence of upper Paleocene and Eocene beds of soft sands and clays, separated by an unconformity from the underlying Cretaceous Chalk Formation that forms the adjoining headland of West High Down. Due to geological folding of the Alpine orogeny, the strata in the main section of the bay are near vertical, with younger rocks with progressively lower dips to the west. The sands are coloured due to oxidised iron compounds formed under different conditions. Alum Bay Chine begins as a small wooded valley descending eastward from the junction of the B3322 and the road to Headon Hall. It soon broadens into the clay ravine through which the path and chairlift from Needles Park descend to the beach. Alum Bay is on the far western tip of the Isle of Wight, and is known for the beautiful multi-coloured sand of the cliffs. These were a popular tourist attraction even in the 1790s and were a favourite spot of Alfred Lord Tennyson, who is remembered with nearby Tennyson Down. 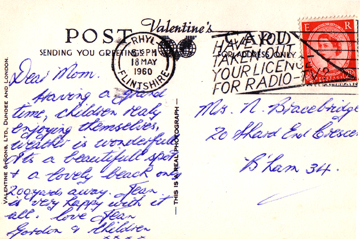 It was also from here that Marconi broadcast his radio transmissions in 1897. Although there were small landing stages in the Alum Bay area before, in 1869 the Alum Bay Pier Act was passed by Parliament. This was a simple wooden pier, and by the 1880s it had been worn out, and so a second Pier Act was passed in 1887, with the pier opening in August 1887. A traditional product of Alum Bay, and a fixture of Isle of Wight tourist shops, is the creation of ornaments using the coloured sands layered in vials and jars. The sands also were used for pictures,a popular craft in Victorian times. In the past, visitors to the bay could climb the foot of the cliffs and dig out the sand themselves, but are now discouraged from doing so because of Health and Safety restrictions. The Needles Park has a facility where people can make bottles of sand, using sand gathered from the frequent rockfalls. In the past it was possible to buy Alum Bay coloured sand by mail order and make ones own sand pictures and bottles at home. After the war, Alum Bay pier was virtually abandoned. 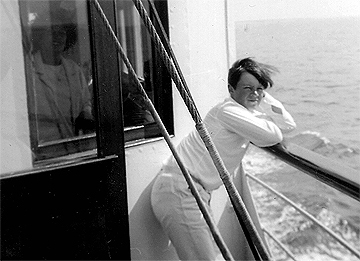 The last steamer to call at it was Red Funnel’s Queen in 1920. By 1925 the pier was declared unsafe and closed, and in the winter of 1927 the pier suffered severe storm damage, and broke in two. Only the shore half remained, and was still in use when Alum Bay was used as a military practice area in World War II. Now, no trace of the pier remains, and Alum Bay just has a small landing stage. The easiest way to get to the bay now is by using the chairlift, which, since 1973, has helped tourists descend from The Needles that has opened at the top of the cliff. The pier was 370 feet long, and was ‘paddle shaped’ so that the pier head was twice as wide as the promenade leading to it. On the pier was a café , gift shop and a small restaurant, where a glass of water cost 1d. The pier was often very busy, no more so than on July 23 1909, when the 9060 ton German liner Derfflinger ran into the Shingle Bank off the Needles, and two-and-a-half miles from Alum Bay. She was trapped for two days before the tugs nearby were able to pull her free, all of which was witnessed by people on the pier. Several paddle-steamers called at Alum Bay, including the Princess Beatrice, Prince of Wales and Lorna Doone. Even islanders enjoyed travelling to Alum Bay on the paddle-steamers – day trips were available there from Yarmouth in the summer of 1909. Steamers on the London And South Western Railway frequently called there until the outbreak of the Great War in 1914. The Saunders-Roe (later British Hovercraft Corporation) SR.N6 hovercraft (also known as the Winchester class) was essentially a larger version of the earlier SR.N5 series. It incorporated several features that resulted in the type becoming the one of most produced and commercially successful hovercraft designs in the world. While the SR.N2 and SR.N5s operated in commercial service as trials craft, the SR.N6 has the distinction of being the first production hovercraft to enter commercial service. In comparison to the SR.N5, the SR.N6 was stretched in length, providing more than double the seating capacity. Some models of the craft were stretched further, enabling an even greater capacity. Experience gained in the development of the SR.N6 has been attributed as heavily contributing towards the design and production of the largest civil hovercraft to be ever produced, the SR.N4. Several major design features of the SR.N6 appeared on both the SR.N4 and further hovercraft designs by Saunders-Roe and its successor, the British Hovercraft Corporation. The SR.N6 was powered by a single marinised model of the Bristol Gnome turboshaft engine; this drove both a single rear-facing 9 ft (2.74 m) diameter 4-bladed Dowty Rotol variable-pitch propeller along with a 7 ft (2.13 m) diameter centrifugal lift fan. The Gnome engine was an expensive component for operators, leading to some establishing their own internal overhaul facilities and making arrangements with other Gnome operators, including the Royal Navy, to reduce costs from relying on costly services from Rolls-Royce Limited. Around 20 per cent of the operating costs of the type have been attributed to maintenance of the 4 ft flexible skirt, which reportedly lasted for up to 500 hours, while similar cost levels have been reported for fuel. Early on, the SR.N6 was outfitted with an improved skirt, featuring fingers and forward puff ports, which resulted in improved forward control and reduced skirt wear; fingers had not been present upon the initial version of the skirt used prior to 1966. The endurance of the fingers would be progressively improved over time, issues with salt spray negatively affecting both the engine and propeller were also encountered early on. An initial experience of some components having short overhaul lifespans or being unreliable was encountered during early days. During the early years of not only the SR.N6 but other hovercraft as well, the hovercraft skirt remained an unresolved area of difficulty during this era. The SR.N6 was piloted from a forward-seated position at the front of the main passenger cabin. The pilot would exercise control over the direction of the craft via a series of control surfaces that was located immediately behind the variable pitch propeller. Early on, pilots were normally aviators which had been recruited from the Royal Air Force and Fleet Air Arm, however it has been claimed that experienced mariners would often be more skilled at operating the type, if not taking more time to adapt to its atypical form of propulsion, in part due to their familiarity at safely navigating within uncontrolled maritime environments. For navigation purposes, some SR.N6s were outfitted with onboard radar; multiple radar arrangements were used with the type, including pilots receiving radio guidance from on-shore radar operators in some circumstances.